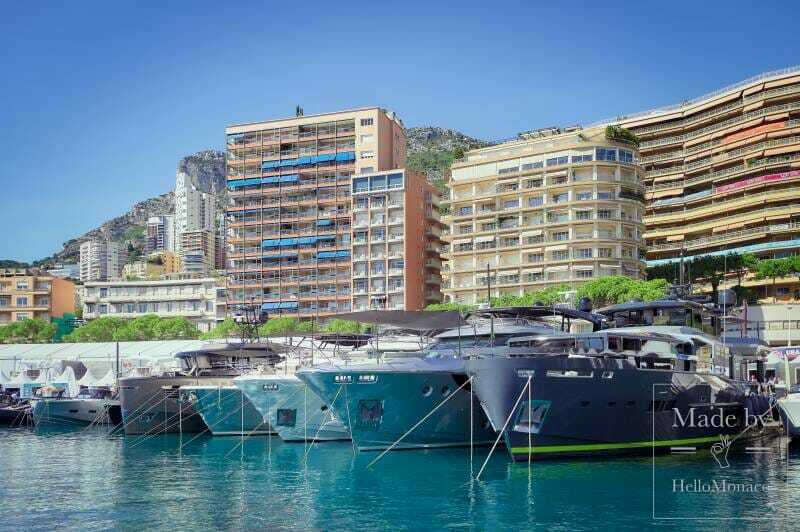 The yacht show has long become an annual event enhancing the Monaco harbour’s beauty. 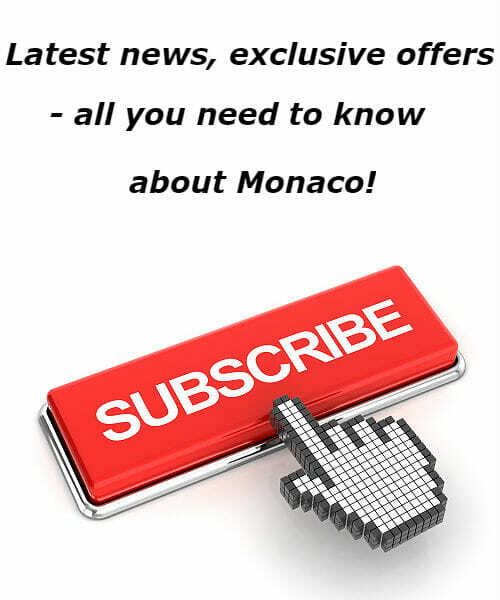 September is a long-awaited month for both Monaco residents and yachting professionals. 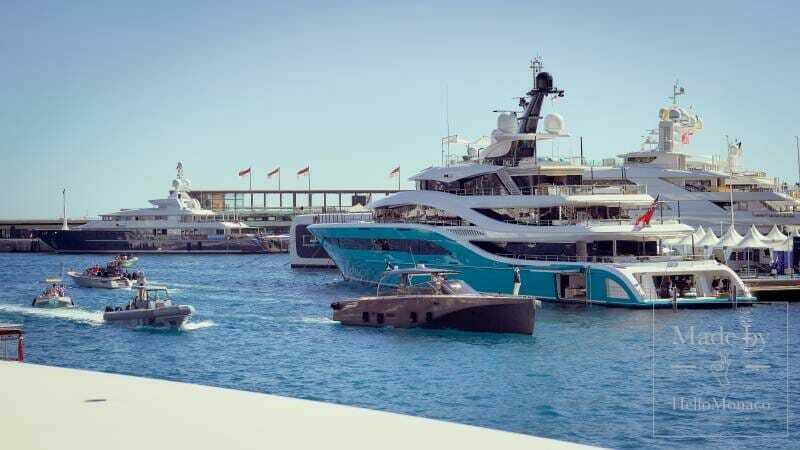 On September 26 – 29, port Hercule was the epicenter of the world’s most anticipated Yacht Show, demonstrating the latest super yachts and mega yachts by leading shipyards. This is more than just a show. 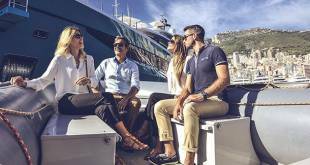 This is an opportunity for hundreds of yachting companies to meet their potential business partners. 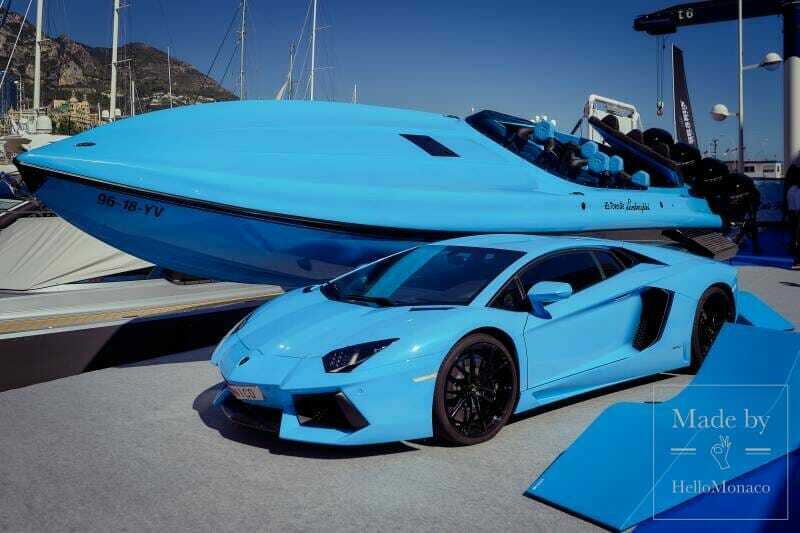 As to private clients willing to purchase a yacht, this is an excellent opportunity to get introduced to the market. 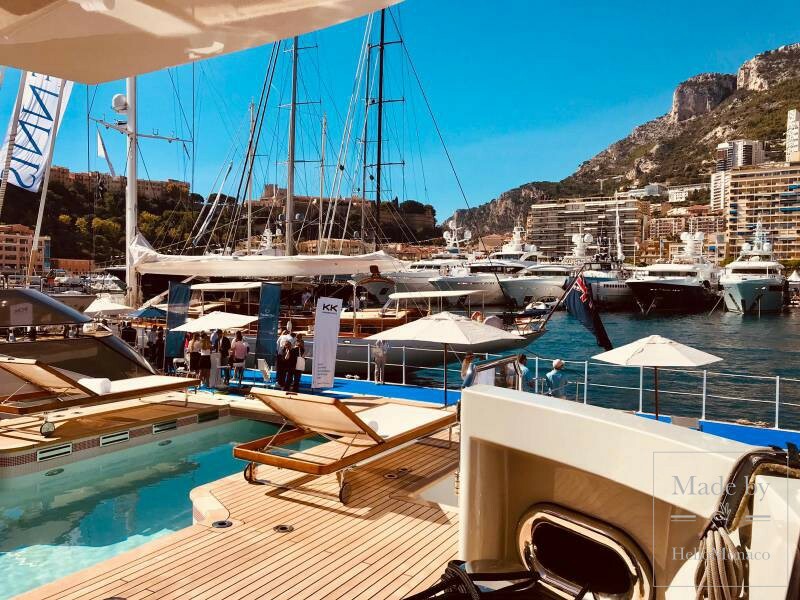 Every year Monaco Yacht Show features about 120 unique superyachts, 40 of them are world premieres. 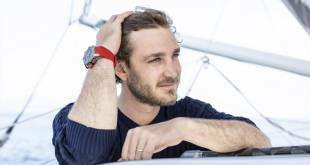 The HelloMonaco team got a chance to visit some of the most impressive yachts of the year. 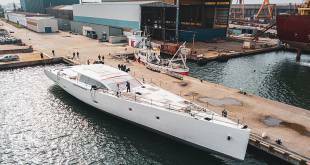 The first one on our list was the 58-meter Volpini 2, built in 2018 by the Dutch shipyard Amels, with its hull designed by Tim Heywood. 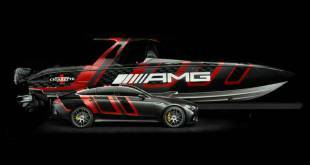 Interestingly, the yacht is powered by both diesel and electric engines. Its elegant exterior coupled with the absolute harmony of the internal space gives you a feeling of a comfortable home. The interior by Raymond Langton is designed in pastel colors and is reminiscent of sea themes. 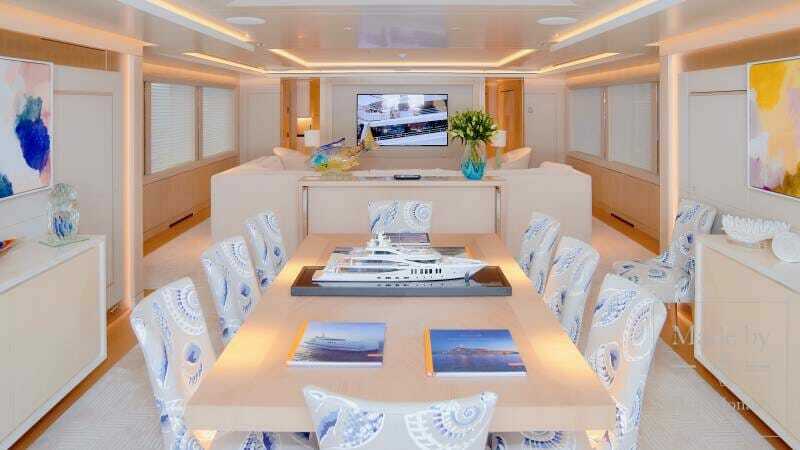 Corals, shells, fish and waves convey a special charm to the yacht’s contemporary interior. 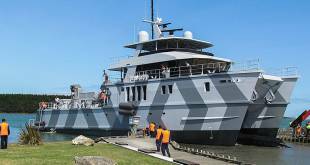 The boat can accommodate up to 12 guests in its 6 cabins. 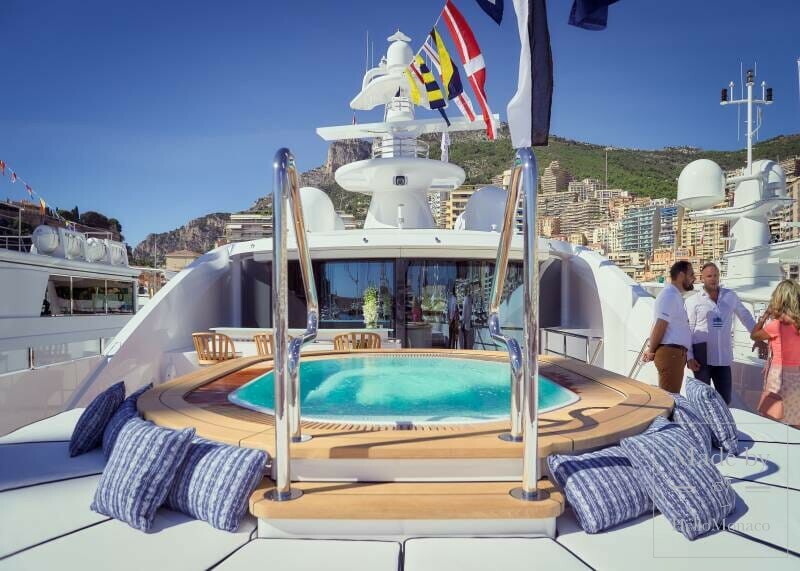 Another impressive feature is an open jacuzzi on the upper bow deck and a 30-meter beach club including a gym, sauna, hammam, a relaxation area and lots of storage space for a selection of water toys. The beach area is quickly accessed right from the lounge. “Innovation” is this yacht’s second name. 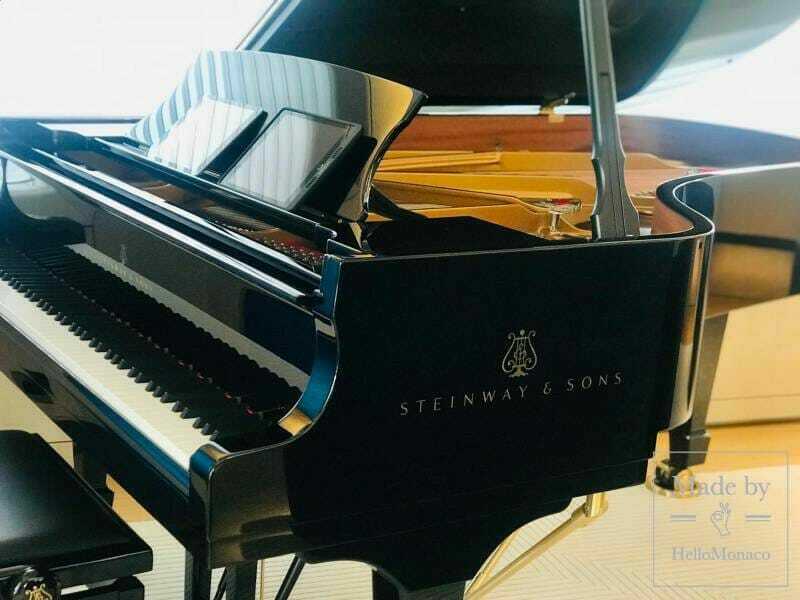 Its light, audio and video systems are all controlled through “smart” applications creating some kind of a “transformer” effect. Televisions appear out of the walls and the lighting is switched on and off with one tablet click. 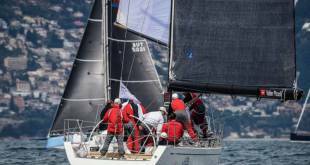 Volpini 2 took 3.5 years to be finalized – its project manager, Romke van der Linde told us. 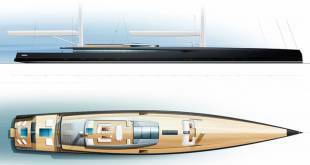 Such a long design process resulted in a boat with a perfect configuration accommodating everything you need, and even more, in its 58-meter space. 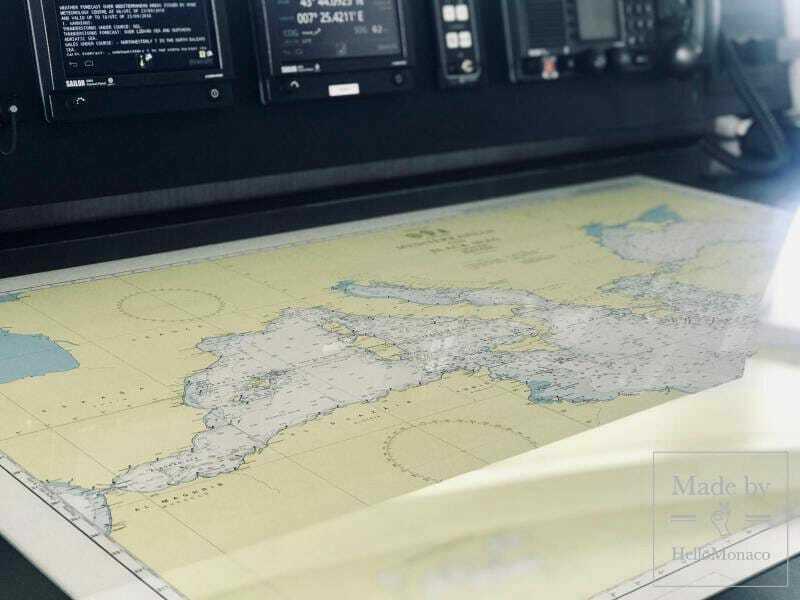 An innovative digital steering console is definitely one of the yacht’s most remarkable features. 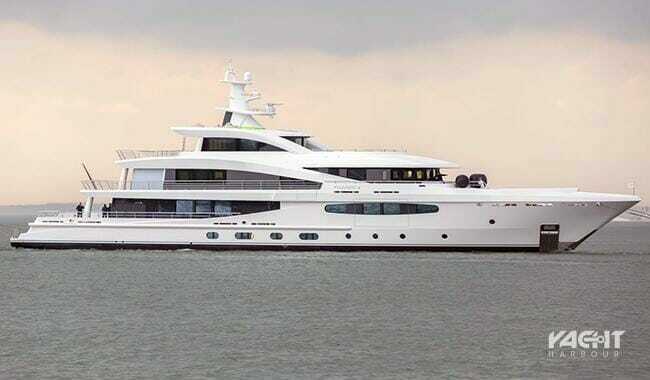 Axioma by Turkish Dunya Yachts is an impressive 72-meter vessel. 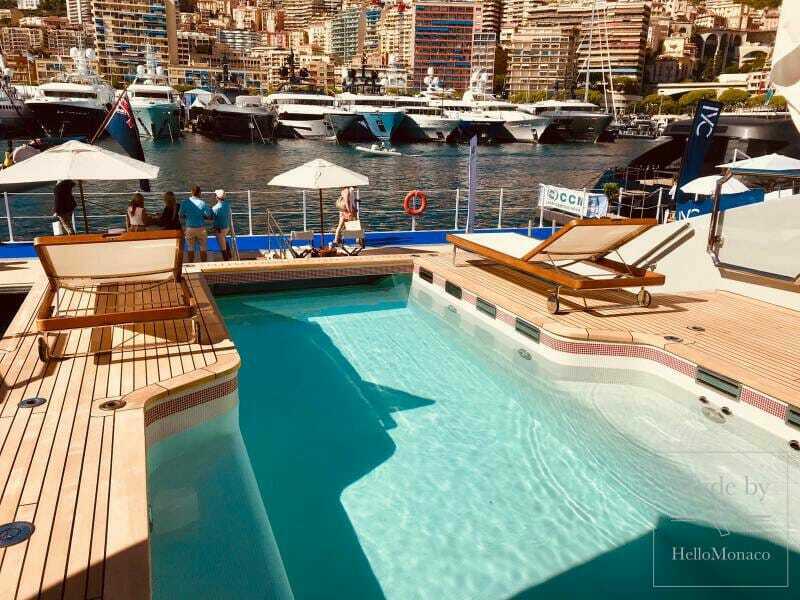 Its spectacular infinity pool located on the lower aft deck is the first thing that catches your eye. 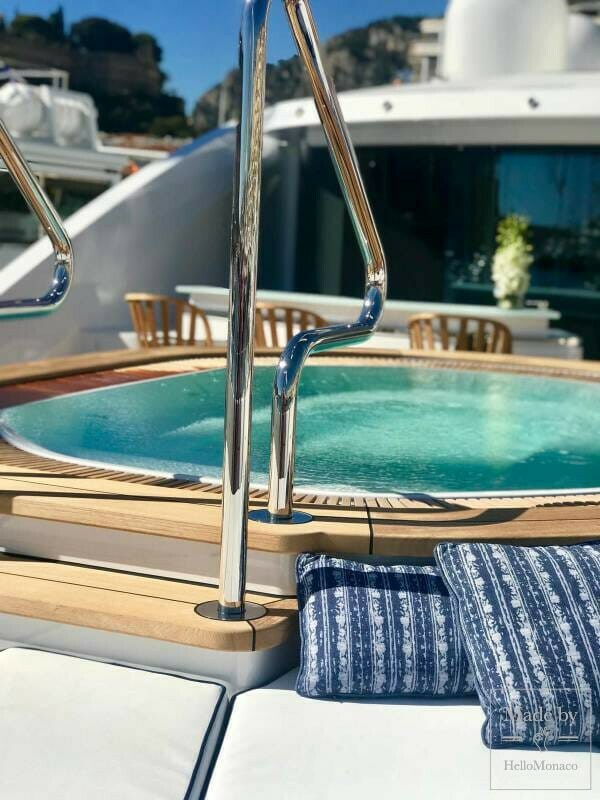 Built in 2013, the yacht is enchanting with its magical interiors by the famous Alberto Pinto. 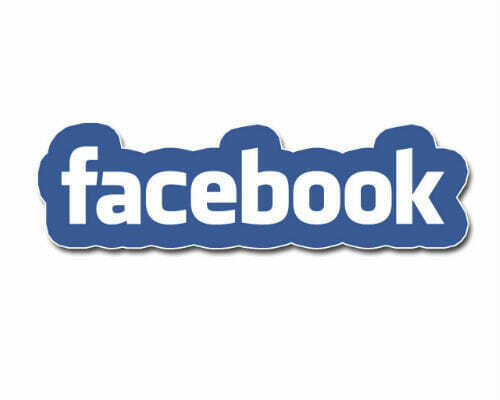 It is now available for a charter. 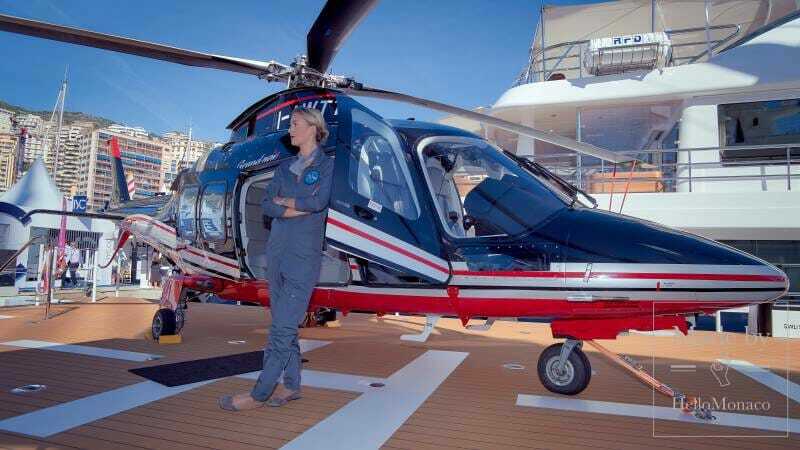 This luxurious experience will cost you 600,000 euros per week, with the price depending on its itinerary. 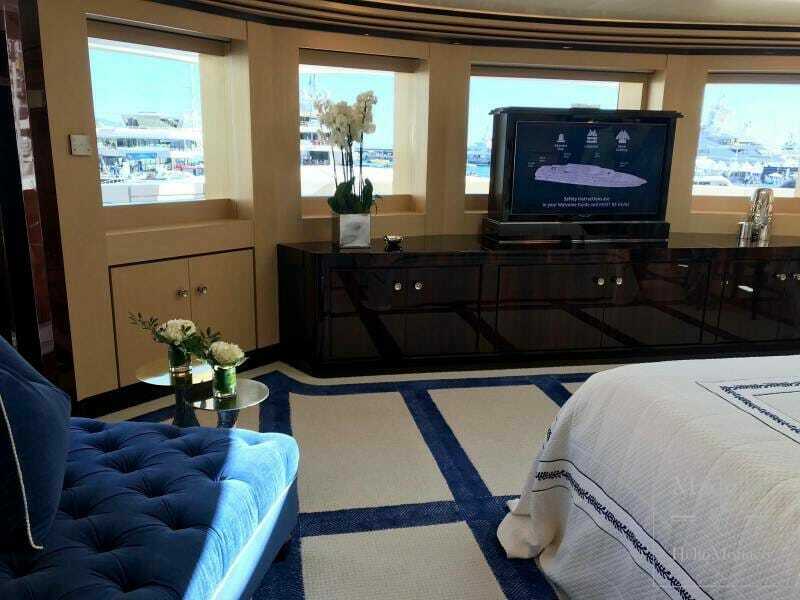 The yacht’s 6 cabins can accommodate 12 guests. The master bedroom, located in the bow part is luxurious and spacious. It stands out owing to the huge number of windows and its access to a private terrace. Unique double ceilings in the lounge are definitely impressive too. 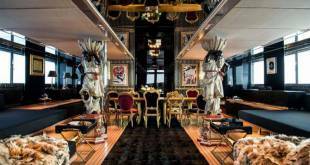 An oriental-style double-decker lounge is another unusual solution for a private yacht. And last but not least, is an extraordinary work of art. 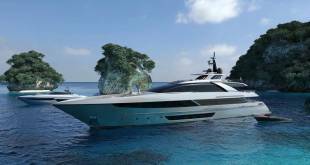 The Yacht Show 2018 awarded the 90-meter DAR (Project Shark) the title of “Yacht with the most beautiful exterior”. We personally believe that DAR is equally enchanting both on the inside and outside. 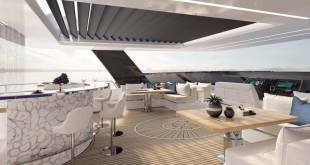 Delivered by Oceanco this year, its interior is impressive in its rare natural materials. 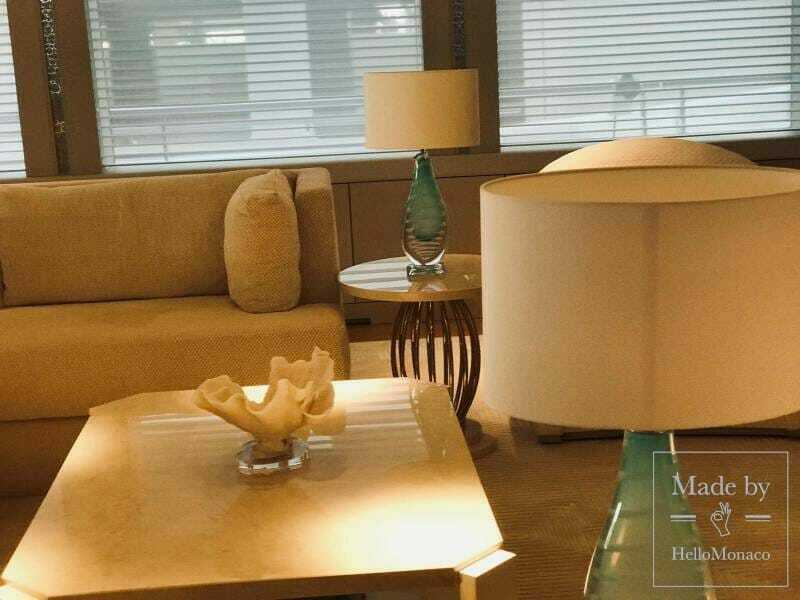 Mother-of- pearl, marble, leather, porcelain, quartz – to name just a few materials used in its decor. The designer duo, Nuvolari & Lenard, must have been inspired by the “Beauty in details!” theme. Exclusively hand painted by a Japanese artist, butterflies and carps even adorn the bathroom walls. 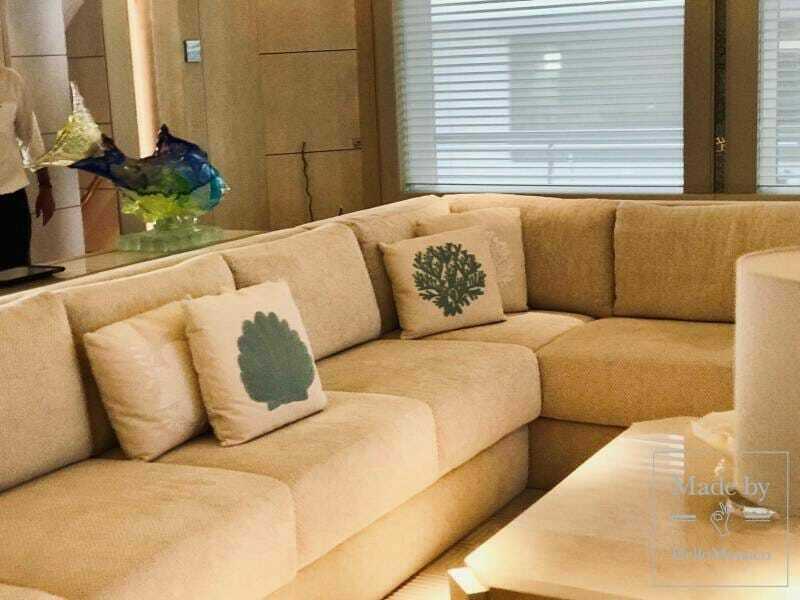 Some very realistic looking feathers are engraved in the lounge’s leather decors. Sculpted mystical oak trees grow in its halls. The interior is, without a doubt, inspired by nature itself. 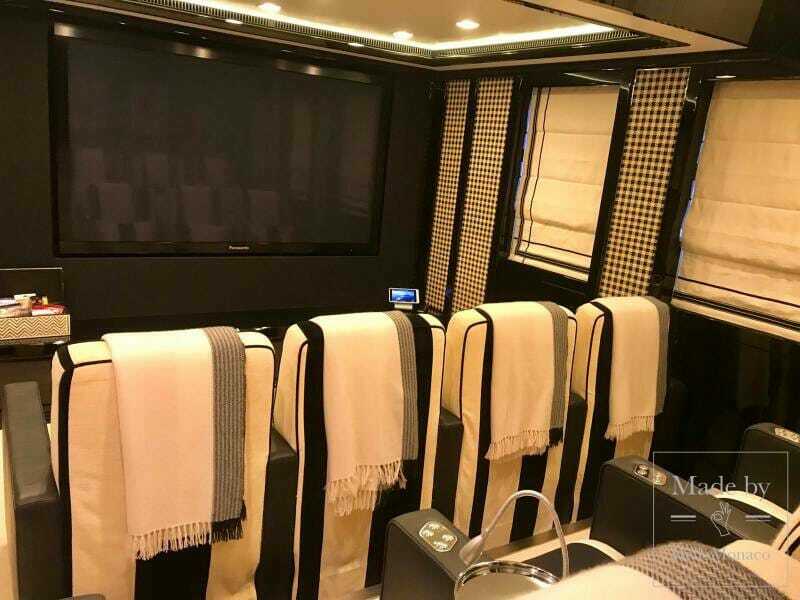 The yacht’s 6 cabins accommodate 12 guests. The aft placement of the master bedroom comes unexpected as the bow location is more traditional. The DAR manager explains this choice by the owner wishing to have a panoramic view and a large private terrace for his relaxation. DAR also features a selection of amenities. 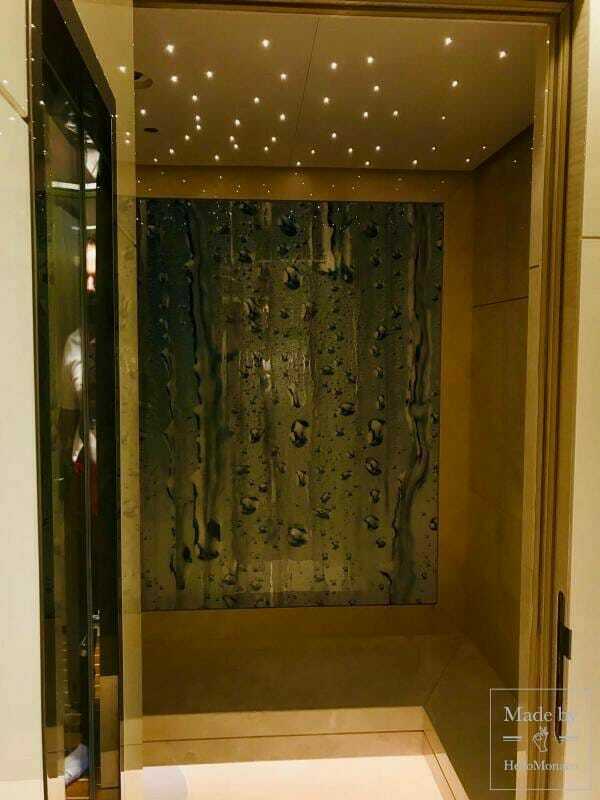 Its elevator has a beautiful marble floor with a fish pattern. 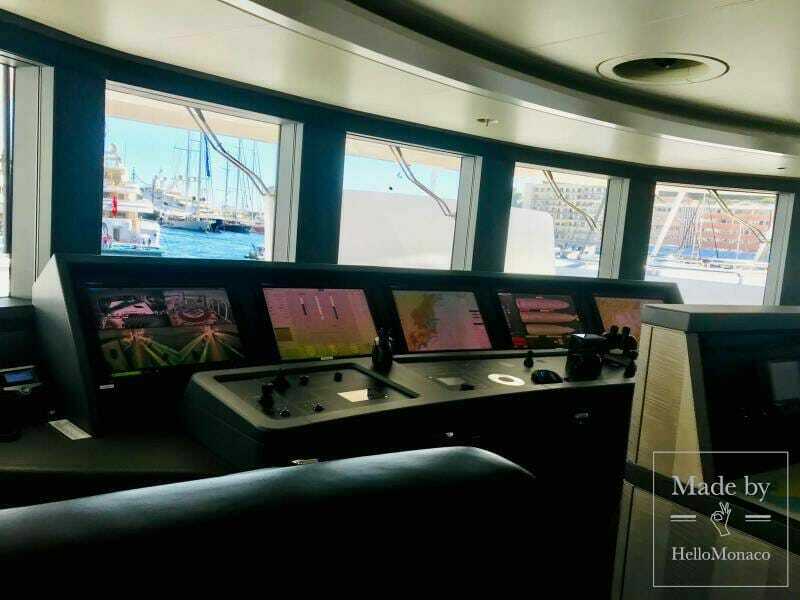 There is also a swimming pool with a built-in waterfall, a spacious tender garage, a crew area, a gym, a beach club, a sauna, a helipad, a dining room, a bar and much more. 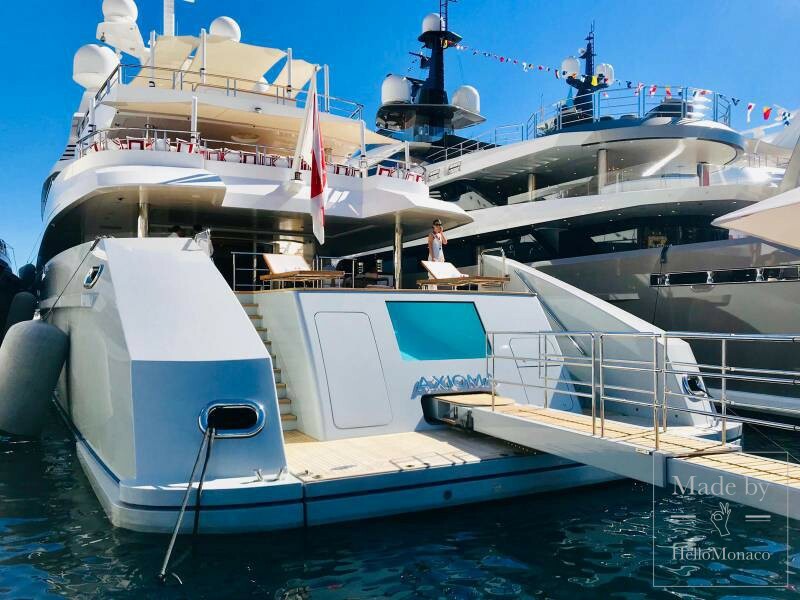 This incredible yacht, looking like a hammerhead, is certainly worth a visit! 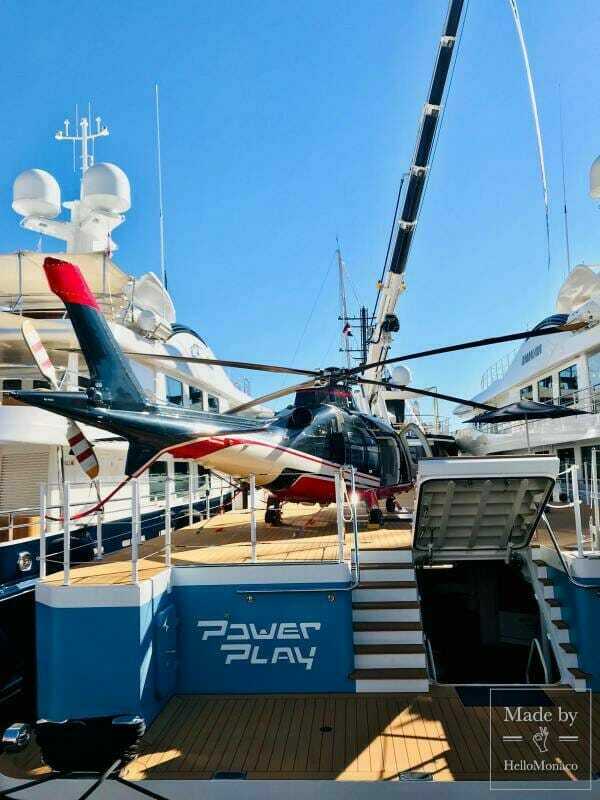 The Yacht Show definitely strives to put on display the most innovative yachts. But it also gives prominence to some latest automotive industry achievements, exhibited at the Car Desk. 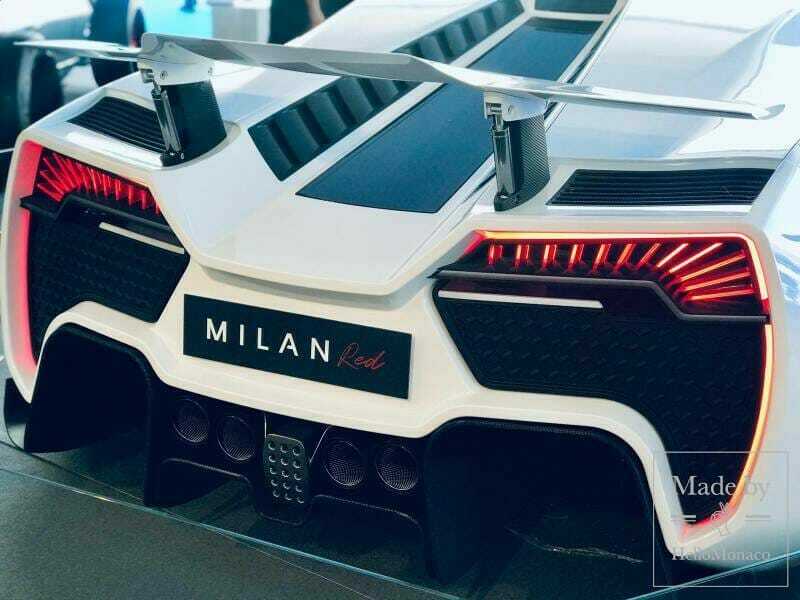 We were thus impressed by the futuristic Austrian hypercar “Milan”. 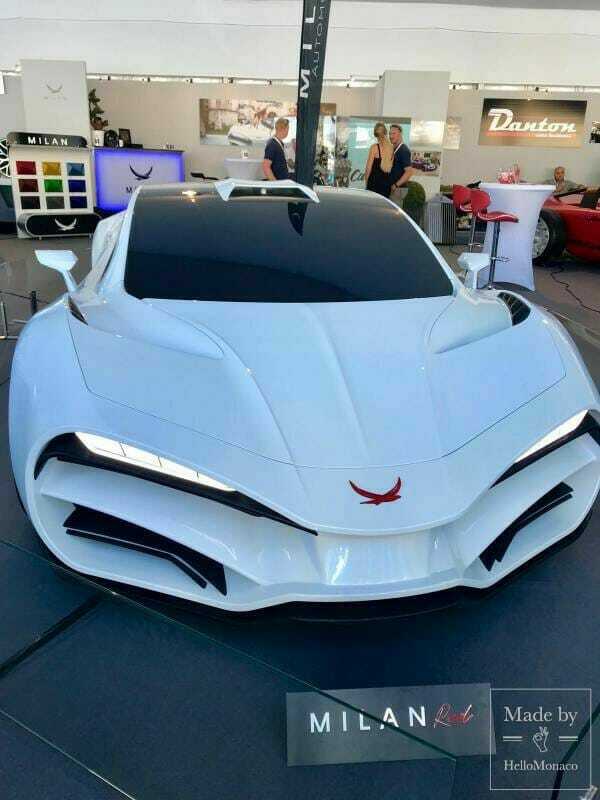 According to Monika Ottermayr, the company’s representative, this concept car is planned to be released by 2020. It owes its name to the falcon Milan, living in the developers’ headquarters. Its lines suggest indeed the wingspan of a bird. 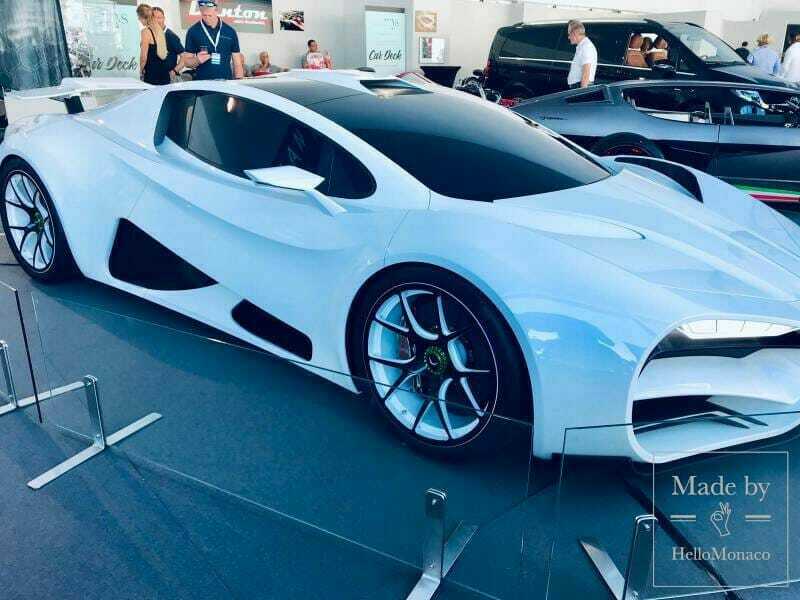 The hypercar is potentially one of the fastest cars in the world, with its 1306 horse power. Port Hercules also hosted the largest yacht ever designed in Asia. 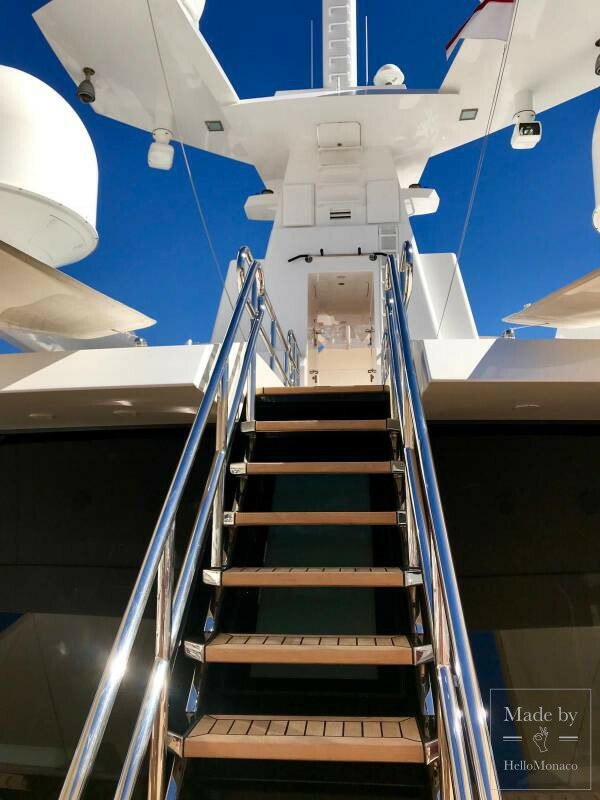 The 88.5 meter Illusion Plus is a symbol of true luxury. Its smooth exterior vaguely resembles the design of a Bentley. 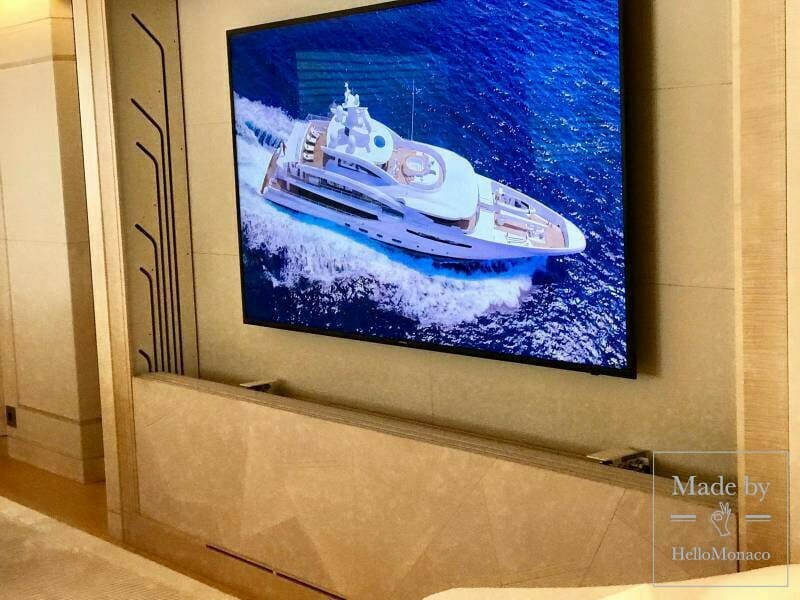 In addition, Monaco Yacht Show 2018 awarded the yacht the title of “The Most Comfortable Interior”. 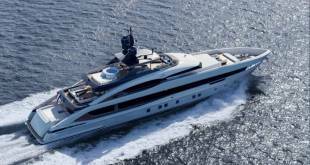 The 77-meter turquoise “Go” by Turkish Turquoise was another remarkable yacht. 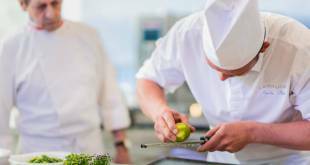 The shipbuilder’s chef-d’oeuvre made its debut in the Principality. Our special regards to Verpeka Dolling www.verpeka.com and personally to Natalia Verpeka and Rob Dolling for organizing on board visits for HelloMonaco’s editor’s team. 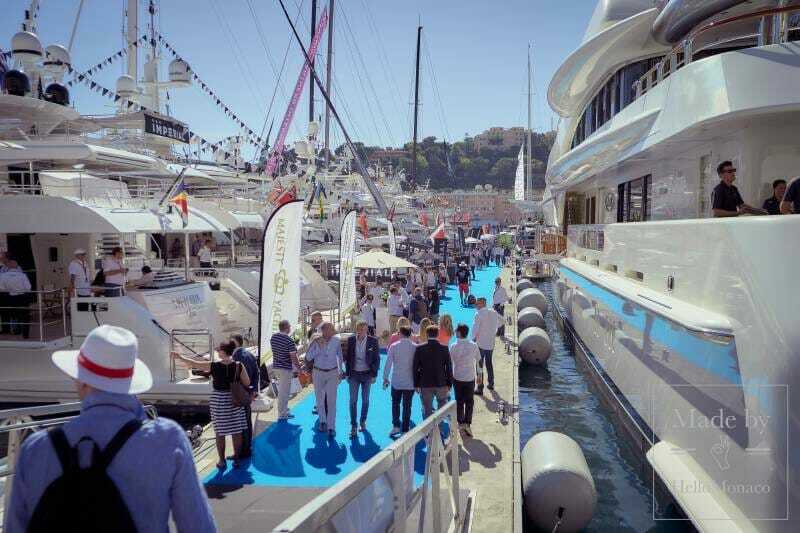 We believe that port Hercule will keep exhibiting the very best world premieres during this unique autumn show-time. 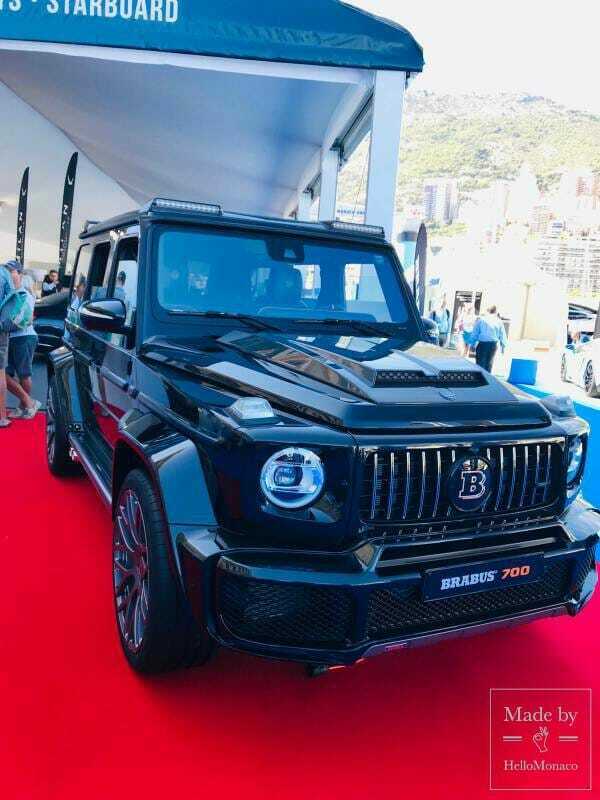 Thank you for this triumph of greatness and grace, the Monaco Yacht Show 2018!